Whoever said it’s tough at the top seems to have forgotten what it’s like getting there in the first place. It may have been windy, cold and cloudy, and there might have been rain forecast, but it was NOT tough at the top of Frenchmans Cap. Just how often do you get to be in such a place? Tim and I put on everything we’d summited with, and settled in to share the sheer, wild joy of being there. Clouds whooshed around us: wispy and thin one minute, revealing wedges of the wider world; darker and dense the next, all but engulfing us. Memories stirred for me as we explored the broad summit. 31 years ago I’d been part of a large group that had come here. Clouds had featured then too. That time they had also cleared a little, giving us a clear blue sky above and some deliciously warm sunshine. But the clouds beneath had remained resolutely in place, giving us no views of our surroundings. I was startled to remember that back then we had not only come all the way here from Lake Vera, but had gone back there the same day. I would have been tempted to blame such an epic day on the folly of youth. But I know that our 1983 walk was led by a 60-something year old Ray Spedding. 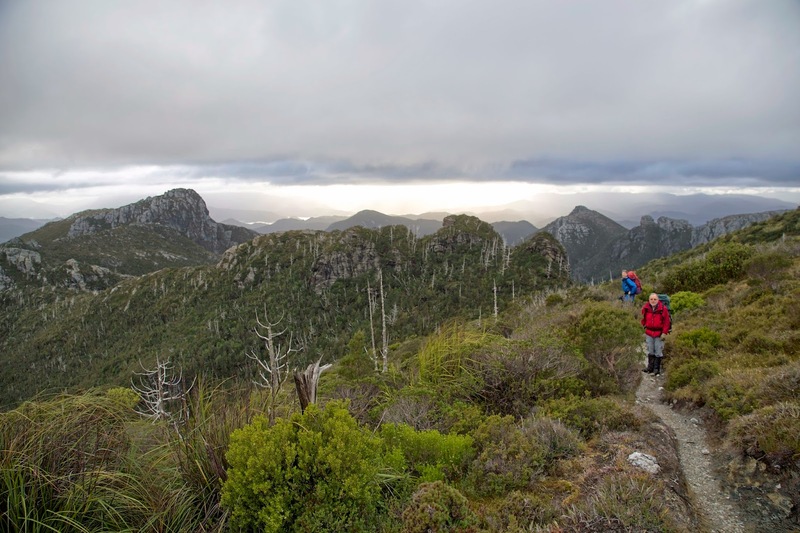 An early bushwalking mentor of mine, Ray continued to do hard walks for many years after the Frenchmans trip. 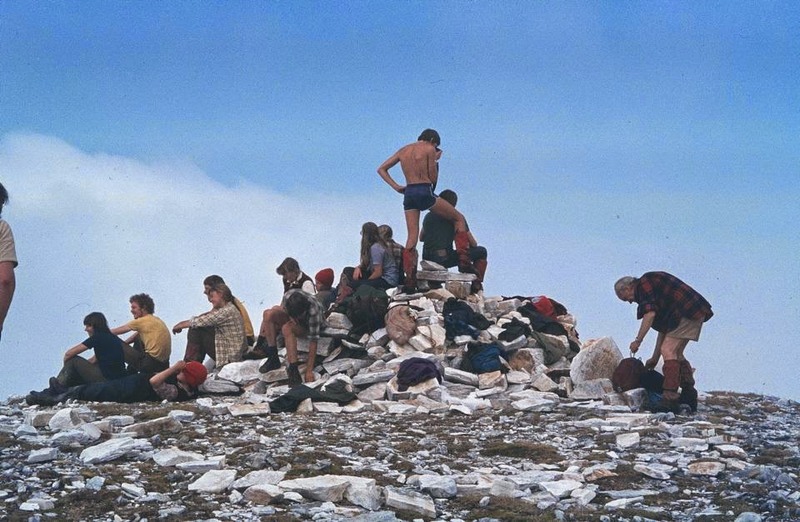 He even summited Federation Peak in his 70s, and lived into his 90s. As if today’s summit hadn’t been inspiration enough! After maybe an hour soaking up the summit, we realised the clouds were not giving up. If anything they’d been reinforced, and as we scrambled down towards North Col it began to rain lightly. It was time to get back to Tahune’s snug little coal stove. Along with our mate Nick, we found a young Austrian and a South Australian sharing the hut. The Austrian had come up from Lake Vera in what sounded like an incredibly short time. 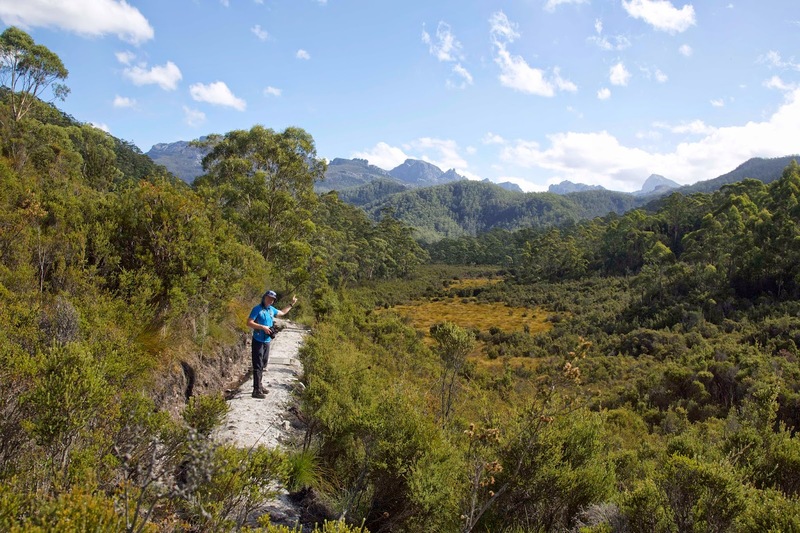 He was quite wet, and his gear was torn – courtesy of two weeks in Tassie’s south-west – but he looked strong and fit. Next morning the Austrian left early, and bounded up the steep track towards North Col in apparent haste. We were up early too. By unspoken agreement we were considering going all the way out today. Eventually we spoke about it, and agreed on a rough timetable for getting back to the highway before dark. We’d need to get to Vera Hut for lunch, and leave there shortly after. Once you start thinking about home on a long walk, your mind shifts a gear – and your body follows. You are horses headed for home. Sections of track that had seemed arduous and slow on the journey in are now straightforward. We strode up from Tahune, advanced quickly through Artichoke Valley, stopping only for scroggin at a cave beneath Nicoles Needle. We were soon at Barron Pass, ready for the steep descent to Lake Vera. If there is a more intricately beautiful bit of forest on this walk than the one between the pass and Vera, then I haven’t seen it. We marvelled at it afresh, amazed at Philp and co., the people who first found a route up through this steep, scrub-filled forest. We revelled too in not having to gasp for breath. ‘Though there are walkers who say they prefer ascending to descending, I’m not one of them. Only the knee jarring that can accompany a descent like this makes it remotely close to difficult. That’s one of the reasons I use trekking poles, to make me into a quasi-quadruped. Towards the bottom of the slope the Austrian walker caught up with us. 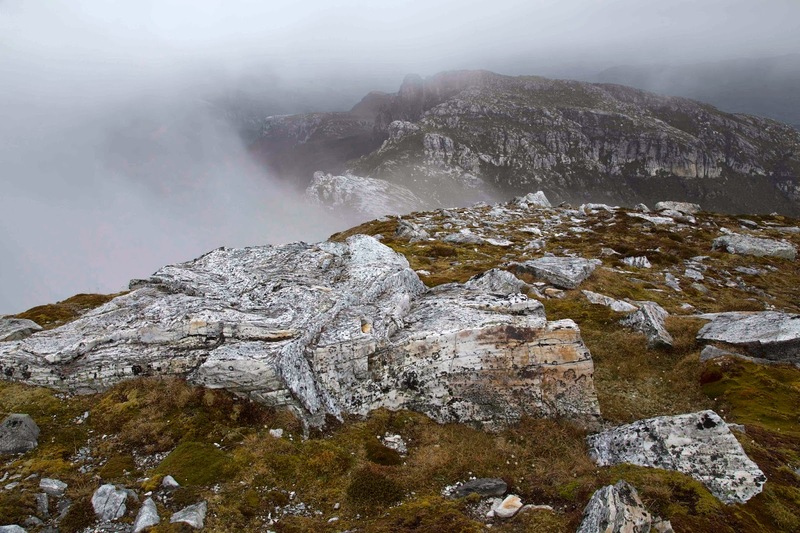 He had summited – in thick cloud – and was now on his (hasty) way back to Lake Vera. Just for fun I tried to keep pace with him once he’d passed us. For maybe five minutes I kept him within sight, helped by the fact that he occasionally paused – very briefly – to photograph forest scenes. But soon the fast-forward Austrian was lost to sight and sound. We caught him later at Lake Vera, where he was going to stay the night. He’d stripped off his torn merino top, and was lying lizard-like in the sun which was now asserting itself, even on the mountain tops. It turned out that his haste to get here may have cost him the chance to do his sunbaking on the summit. But then hindsight is a fine thing. For us it was clear there would be just enough time to get to the highway before dark. After a quick lunch we hoisted packs again, and set off on what would become a route-march towards the lower lands. 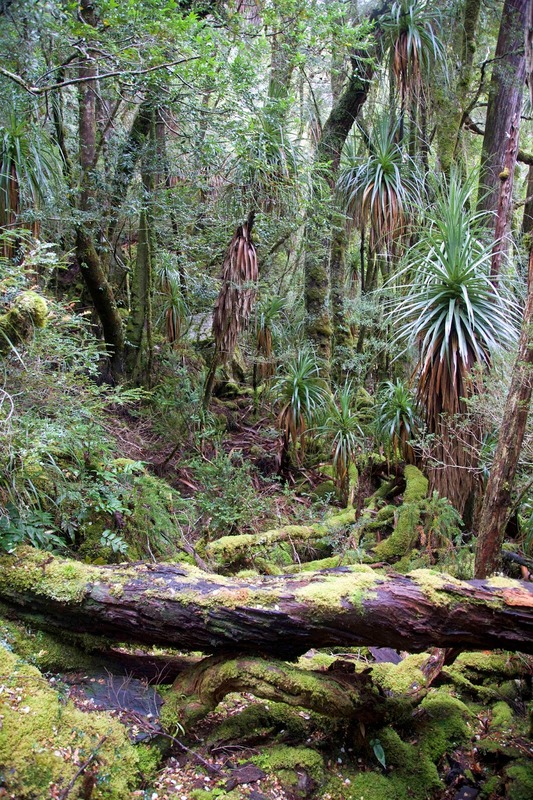 Ten and a half hours after leaving Tahune – in failing light – we staggered past the information booth and into the carpark. At times I had got close to falling asleep on my feet. To say I was exhausted would be an understatement. Likewise with saying I was elated. At the youthful age of 60 I’d completed a hard walk; had got to the summit; had done a 20+km last day, and all without any part of me feeling as though it was about to fall off. Could it be that the spirit of Ray Spedding lives on?